Properly fitting equipment is your responsibility. Dana Marquez, chosen as the first ever recipient of the Maxwell Award for Innovation in Safety, is the founder of HelmetFitting.com. His experience includes being the Assistant Equipment Manager at Oregon State University, Director of Equipment Operations for the University of California-Berkeley, Promotions Manager for Schutt Sports Group and his current position as the Associate Athletic Director Equipment Operations at Auburn University. Dana’s two decades in the sports equipment industry have taught him that an alarming number of young athletes take the field each football season wearing equipment that is not fitted properly. A significant reason for this is the lack of education available to parents and coaches, who are often the ones purchasing helmets or helping children get dressed and ready before games. Dana has had parents and coaches come to him time and time again with questions about how to fit helmets properly. Dana saw HelmetFitting.com as an opportunity to share his personal expertise of fitting athletes for sports equipment with parents and coaches in an effort to offer the highest level of safety for young players. Through the HelmetFitting.com eLearning courses, you’ll learn step-by-step how to fit helmets, shoulder pads, body pads, and footwear correctly. 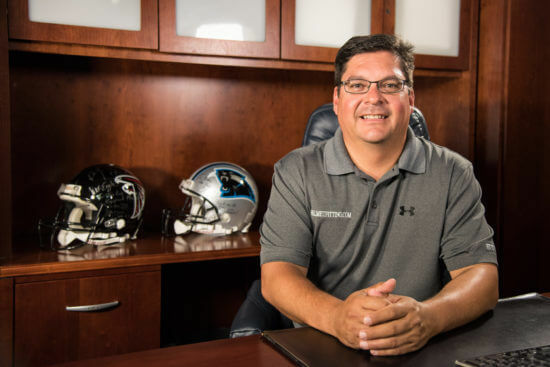 You’ll hear directly from Dana Marquez himself, who has helped youth football programs across the country fit players when their coaches and staffs struggled to do so. Dana’s past experiences with assisting young athletes have inspired him to help others and, in doing so, to expand the opportunity for every player to safely enjoy the game of football.